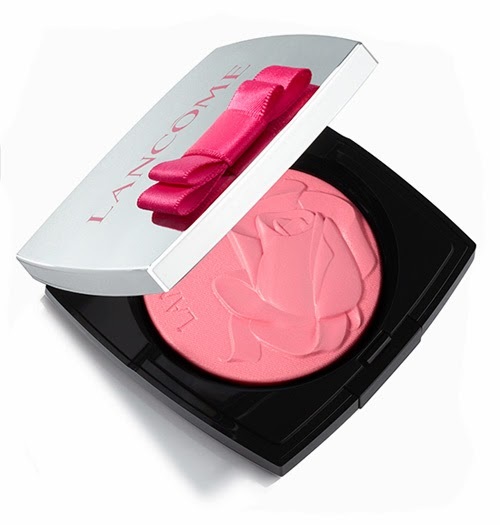 Landing today and limited edition, this absolutely, ridiculously, almost criminally gorgeous Highlighter Blush is a key element in Lancôme’s beautiful new French Ballerine Spring 2014 collection. The French Ballerine lineup - with imagery featuring the flawless and dancer-petite actor Lily Collins - is feminine and pretty to the core, and the centrepiece is undoubtedly the Rose Ballerine Highlighter Blush. From the detailed rose on the palette’s powdery surface, to the hot pink bow on the compact’s cover, this is a product that will have you wanting to touch up in public just to bathe in the glow of the covetous looks it will most definitely get. The texture is a finely milled and cool leaning ‘ballet slipper’ pink hue, with an ultra fine silvery shimmer that is perfectly pretty. While the consistency is a little on the sheer side at first, it can be built up slightly to show more colour – fairer skin types will absolutely love the rosy glow of this blush, but I’ve found that it is more on the highlighter side for my more olive skin. This is what I love most about it, as well as the fact that it lasted a decent six hours plus on first wear. It required several passes with my brush to show clearly on my more-tanned-at-the-moment complexion, but I don’t mind the extra effort, as the delicate shade is not only very complimentary, but blends seamlessly and easily along the skin. The shimmer is only visible when light catches it, and I have fallen in love with using Rose Ballerine a luminous booster over a more matte blush as well as on its own by day. It is most definitely a universally flattering shade of pink, and will work on most skin tones depending on how it is applied. The French Ballerine Spring 2014 Collection from Lancôme most definitely oozes prettiness, but products like this show it is extremely versatile as well. Love it.